If you are in the business world, it is likely you have heard the term Total Quality Management (TQM). TQM is a business model for accountability. A “system” to control the quality of the end product. Most would agree this is a very important system to have in place in the private sector when creating a good product that will successfully be sold to consumers. In order to control the quality of the product, you must collect a lot of data. But, what if the “product” is a child? In the 1990s at the National Governors’ Association meeting in Minnesota, (TQM) in Education was presented. Included in the book ‘The deliberate dumbing down of America: A Chronological Paper Trail,’ was the following story. Is this the future for “experienced” educators who don’t want to do what will be expected of them under the latest re-authorization of the Every Student Succeeds Act (ESEA), now known as the Every Student Succeeds Act (ESSA)? 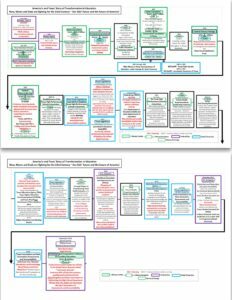 I want to give you the timeline for what I call, the “Points of Compliance,” to create the TQM model of education in Texas. This will show a well-coordinated, bi-partisan plan that is precisely what we are seeing here in Texas today. A state, by the way, that said NO to the Common Core National Standards, but “YES” to TQM and College and Career Readiness Standards. To begin, Hillary Clinton and the National Center on Education and the Economy (NCEE) in association with Marc Tucker pushed the workforce development model using TQM into the schools. In June 1991 the U.S. Department of Labor in the Secretary’s Commission on Achieving Necessary Skills (SCANS) report titled Learning a Living: A Blueprint for High Performance which set up performance standards for YOUR children. This is what put in place the entire workforce education agenda. “Secretary of Education Lamar Alexander, Chairman Kean of the New American Schools Development Corporation, and members of the board of the newly formed corporation briefed reporters on their meeting with the president concerning American education. The New American Schools Corporation was created as a private, non-profit corporation dedicated to solicit donations from American businesses for the creation of 535 new experimental schools. The corporation fulfills one of the goals of President Bush’s education initiatives by bringing private business into the sphere of education”. In 1993, Robert Reich, Secretary of Labor under Bill Clinton from 1993 to 1997 pushed the SCANS report into schools across America. In 2000, the Bill and Melinda Gates Foundation gave the Texas Association of School Administrators (TASA) a grant for 6.3 million dollars. TASA and the Texas Association of School Boards (TASB) are trade organizations who’ve been tied to the vendors/lobbyists for many years; and, of course, they pay for their agenda by using local taxpayers’ dollars which cover TASA/TASB dues, conventions, etc. Texas Leadership Center Date: June 2000 The purpose of the grant to TASA: to provide superintendents and principals from public and private schools access to quality leadership development focused on technology integration and whole systems change. In 2006 TASA’s New Mission to transform Public Education begins. According to TASA’s timeline in 2006 public school superintendents from across the state were inspired to come together to create a new vision for public education in Texas. Meeting as the Public Education Visioning Institute for two years, they shared ideas on how to transform Texas public education to meet the needs of 21st-century students. In 2007 the Texas Education Agency (TEA) was given a $7 million dollar grant by the Gates foundation. With the stated purpose : to provide funding towards a longitudinal evaluation of the Texas High School Project now known as “Educate Texas” funded by“Communities Foundation of Texas”, as a way to understand the effectiveness of individual projects and programs, as well as overall effectiveness. In 2007 a new special interest group formed by Mike Moses and Bill Ratliff called, Raise Your Hand. As Donna Garner wrote back in 2007. Ratliff and Moses are continuing to swill from the education trough by forming a new organization called Raise Your Hand to pressure the people for more tax dollars for Texas’ public schools. Have these two gentlemen any credibility on the subject? In 2008, TASA created the New Vision for Public Education Document. In 2009, the federal Stimulus package, which Texas received 18+ million dollars, required the construction of particular data systems in exchange for the money from the State Fiscal Stabilization Fund. In 2009 the Race to the Top program launched a successful “Race to the Top” grant program which required the state to adopt the Common Core Standards, to adopt a state-mandated assessment aligned with Common Core, and to commit to expanding its student database. Texas said NO to the Common Core National Standards, but we said yes to College and Career Ready Standards and TASA’s New Vision for Public Education. The 82nd Texas Legislature made the Consortium official with Senate Bill 1557. The law established the Texas High Performance Schools Consortium and charged it with improving student learning in Texas by developing innovative high-priority learning standards and assessment and accountability systems. In 2011 Texas legislators overwhelmingly pass SB 6. SB 6 allows textbook publishers to bypass the state adoption process. Under SB 6, the Instructional materials (IM)’s only have to cover 50% of the TEKS (even though school districts by law are required to cover 100% of the TEKS). 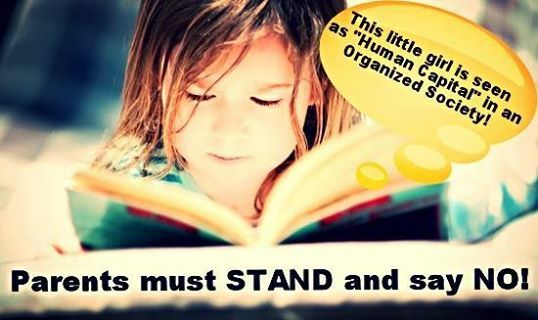 It is SB 6 that opened the door for CSCOPE and other instructional materials that are not aligned with the SBOE-approved-and-mandated TEKS to proliferate our public schools. In addition, for the permanent education fund (PEF) to now be used for professional development of teachers for online digital learning. 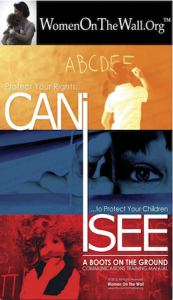 In January 2012, the Family Education Rights and Privacy Act (FERPA) was gutted, and no longer protected our children’s data from almost unlimited sharing. Under the new regulatory interpretation, the U.S. Department of Education (USED) (and in fact state departments of education) may disclose personally identifiable student data to literally anyone in the world, as long as the disclosing agency uses the correct language to justify its action. In 2012 according to TASA, The Texas High Performance Schools Consortium takes shape — originally 23 Texas school districts — were selected in 2012 by the commissioner of education. The Consortium began its work in October 2012 with superintendents and district teams working through the fall semester to determine strategy for conducting the Consortium’s work as specified in SB 1557 and to produce the Consortium’s first report, delivered in December 2012. In 2012, TASA prepared a sample school board resolution to build support for the anti testing STAAR Opt out movement. By January 2013, 881 Texas school districts — 86 percent of Texas districts and 91 percent of its students — had adopted the resolution. Dozens of Chambers of Commerce and PTA groups across Texas passed similar resolutions. In 2013 Texas passes HB2103 which opened Texas students, parents, and teachers up to possible data mining by third-party entities.This bill set up cooperating agencies including the Texas Education Agency (TEA), the Texas Higher Education Coordinating Board (THECB), and the Texas Workforce Commission (TWC) that will share data.Three centers for education research (CER’s) were set up to conduct research using the data from the TEA, THECB, and TWC that goes back at least 20 years.The data will be known as the P-20/Workforce Data Repository and will be operated by the Higher Education Coordinating Board. In 2013 Texas legislators pass HB5 (Workforce Development) law. Both Republicans and Democrats overwhelmingly pass HB5, authored by Rep. Jimmy Don Aycock and Sen. Dan Patrick. The Workforce Development (HB5) just like the Common Core National Standards, expands the target from K-12 (Kindergarten through 12th grade) to a P-20 (Pre-school through College, Trade or Graduate School) system in order to control the economy and control our children by funneling them into certain career pathways. In 2013 TASA Published its Concept Paper on Transforming Texas Public Schools, which provides history and background on the transformation movement as well as an outline of the Consortium’s work in the areas of digital integration, high-priority learning standards, multiple assessments, and community-based accountability. In 2014, the Future-Ready Superintendents advance their MISSION: School Transformation. The Moral Imperative: From Vision to Action, a report that captures the Institute participants’ desire to help launch the vision from the Public Education Visioning Institute into action. In 2014 the State Board of Education (SBOE) and Texas Education Agency (TEA) develop a process for the revision of the English Language arts and Reading Texas Essential Knowledge and Skills (TEKS) that included the identification of high-priority learning standards by curriculum experts from the field. In December 2014, the Consortium released its second report. In December 2015 Congress reauthorized the Elementary and Secondary Education Act (ESEA) which replace No Child Left Behind and is now known as the Every Student Succeeds Act (ESSA). As Rep. Tim Ryan, Ohio stated, this is the “New Common Core,” while he was debating the Every Student Succeed Act (ESSA) is about character traits not academics. It is a clear shift to Competency Based Outcomes- The Next Generation of Assessments and Accountability shifts from the “Mental” (Academics and Knowledge-Based Assessments) to “Behaviors” (Performance Standards and Competency for the workforce). “two new Congressional bills that if passed would allow the federal government to control completely the vocational choices and the career/tech training of all students in America – public, private, charter, home schools. Students would be “forced” into certain vocations chosen by the federal government – not based upon the student’s own talents and desires and not based upon parental guidance. Students’ vocations would be decided based upon the economy and the commerce in each regional area. Federally controlled certifications and federal dollars would dictate who gets a job. America is built upon the premise that all citizens are free to determine their own future and that every student should receive a deep and wide, foundational education. This then gives the graduate the ability to be flexible to change vocations during her/his lifetime. It is the Socialistic model that allows the State to determine people’s vocational choices. Public-private partnerships were originally meant to help build the schools but not TO RUN the schools. Now through Obama’s Common Core Standards Initiative and these pending Congressional bills (HB 5587, S 3271), public-private partnerships are to be enshrined. They would determine the curriculum that is to be taught since teachers’ evaluations would be measured by their students’ career-tech performance. 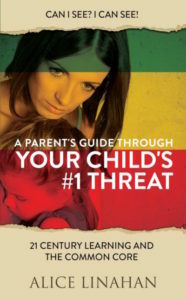 Personally identifiable information, psychological tracking, social-emotional learning – all are being collected on a huge national database created by the Obama administration under the Common Core Standards Initiative. The term “assessments” is being changed to “evaluations” which allows for individual, non-academic measuring of social-emotional learning; and the monitoring and the tracking of students Pre-K through adulthood would become a reality. The creation by the federal government of a psychological profile of each person in America is Hillary Clinton’s 1998 “cradle-to-the-grave” agenda coming to pass. Commissioner of Education, Mike Morath. Commissioner Mike Morath proceeded to restructured the TEA. Putting in place, Teach For America (TFA) federally funded (thru Higher Education Act) pro-charter school Democrat community organizers. One of the most controversial hires being AJ Crabill, Deputy of Governance of the TEA making $180k a year and whose highest attainment of education is a high school diploma, was a major Democrat community organizer. It looks like he had to change his name due to ethics violations in Kansas City. Morath’s new deputy commissioner positions, created as part of a sweeping reorganization of the Texas Education Agency have been filled as follows. Deputy of Finance, Kara Belew is on the comptroller’s payroll already as an Abbott senior policy advisor at 159K as noted in this article. Looks like it pays to work for the TEA and it looks like TFA is a recruiting ground for transformational change agents!! “Teach for America is a $400 million “non-profit” that exists not only to save children, but also to steer public policy, and public dollars, to corporate reformers, primarily through the promotion of market-based solutions: charter district reform, deregulation of teacher education, and merit-based pay. In 2016 Texas Commissioner Mike Morath calls for new non-cognitive character standards to be put in place. Hear in his own words as he speaks at the Next Generation of Assessments and Accountability Commission Meeting. 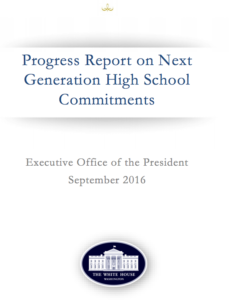 In 2016, the White House is hosting a second annual summit on Next Generation High Schools, recognizing commitments from states and school districts to redesign their high schools. In classrooms across Texas and frankly the country, parents show up to register their child for school and there is NO way to easily say… NO- my child needs to be taught by a teacher, not a computer and my child’s data is not to be shared with any third parties without my consent! Parents are informed they cannot refuse technology for their child while in school because it is now required that they are “21st-century learners”. This is a well-coordinated plan, as seen above, to change the next generation of American children’s worldview from nationalism into globalism and allows for a government controlled economy. Broadened Impact – The College and Career Ready National Standards expand the target from PreK-12 to a P-20W (Pre-school through College, Trade or Graduate School) system. Competency Based Outcomes- The Next Generation of Assessments and Accountability shifts from the “Mental” (Academics and Knowledge Based Assessments) to “Behaviors” (Performance Standards andCompetency for the workforce). Adjustments to Ideology– Change American’s worldview from nationalism into globalism and allows for a government controlled economy known as ”Dirigisme” or the more common use–a dirigiste economy. It means essentially a state directed economy. Dismantle traditional public schools in favor of charter like structures (public/private partnerships) that will be forced to generate student data for corporate profit and state control.